What are Green Manures and why do they benefit your garden? Home Lifestyle What are Green Manures and why do they benefit your garden? In this article, Michael Kelly from GIY Ireland tells us all about green manures and how to use them in your garden and what benefits green manure crops bring to your garden. Back in late summer when the broad beans, early peas and early spuds were finished cropping, I cleaned up the beds and sowed a green manure called phacelia in the beds (the seeds were broadcast liberally in the soil and then raked in). The seeds germinated within a few days, and within weeks we had a lovely carpet of light green plants covering the beds. This week, the phacelia was ready to be cut down and dug in to the soil. A green manure is a fast growing ‘cover’ crop grown specifically to add nutrients and organic matter to the soil. While it is growing the green manure protects the soil (its roots hold the soil together) and because it grows so quickly, it also suppresses weeds. 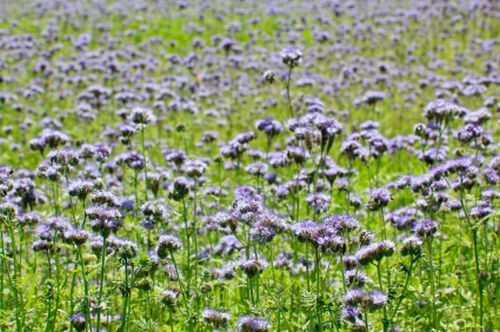 Green manures are dug in to the soil when the plants are still young and typically before they flower (the phacelia was just starting to produce pretty little blue flowers). The green leafy material is very high in nutrients and so, as it decomposes it improves and protects the soil. The upside of digging in when the plants are young is that they are still quite tender and easy to work with. They also break down in the soil quite quickly. Left to get too old and tough, and it becomes a more difficult job. To dig in the manure, I simply used a shears to chop down the manure at ground level. I also chopped at the plants to break them down in to smaller bits as I went. I have heard of people using a strimmer where there are larger areas of ground covered in green manure, but the shears were fine for me and it didn’t take long. I then simply got a fork and turned the soil over, incorporating everything (including the roots) as I went. It’s important not to go too deep – the green manure will rot down best and have the most impact if dug in quite shallow (about 15cm). You can sow a new crop in the bed after three to four weeks – as mentioned above, my beds will be covered down with polythene now so hopefully those nutrients from the green manure will be preserved over the winter months. Do not leave beds bare for the winter – sow a green manure, or cover with a thick layer of manure/compost and then black plastic or straw. This will return nutrients to the soil, keep the worst of the weather off it, suppress weeds and prevent leaching of nutrients. ‘Earth up’ or tie up vegetables such as cabbage, cauliflower and Brussels sprouts. Divide up your rhubarb if you want to propagate, and cover it with a thick mulch of manure. Take cuttings of currant bushes from current season’s wood. Sow broad beans outside now for an early crop next spring. To avoid rotting before germination, make small newspaper cups and germinate them indoors first. Next summer’s garlic does best if it’s planted before Christmas – plant outdoors in well prepared soil in a sunny spot. Though I have to admit I never bother with them, some varieties of onion can over-winter and will be ready to harvest in early summer. Continue to harvest perpetual spinach, cabbage, cauliflower, potatoes, swede, parsnips, apples, pears. Start harvesting leeks, winter cabbage, kale, artichokes, Brussels sprouts. Time to lift carrots and turnips or at least cover them with a good layer of straw to protect them from frost damage. Small garden shredders are available quite cheaply from most garden centres – they are a great investment for improving your compost heap. Chances are you have a huge amount of foliage available from your veggie patch to go on your compost heap at the moment (parsnip leaves, cabbage plants, peas and beans etc). These make fine additions to the compost heap, but shredding them first means they will decompose much faster. If you don't have a shredder use a shears to cut up large leaves, and use a sledgehammer to bash down large brassica stems (and you can cancel your gym membership! ).